A reader switching to OS X wants advice on working with PDFs. One thing I do on a regular basis is use Adobe Acrobat to assemble PDFs for distribution for work. This includes primarily removing old pages and inserting new ones—very rarely use any other content editing functions. Is there an app that will replace what Acrobat was doing for me? Adobe does make Acrobat Pro (now called Acrobat Pro DC) for OS X as well as Windows, but you may be concerned about the cost involved. The list price is $450 outright or $15 a month as part of a Creative Cloud subscription that includes other items. However, Adobe and many other companies offer cross-grade options, where owning a product on one platform lets you swap a license at no cost or at a significant discount for another. Adobe has a documented process for requesting a cross-grade. But you might be able to achieve the same results with the built-in Preview software that’s shipped for years with OS X, and has reached a nice level of maturity at last. Apple has some support pages that explain all that Preview can do, which includes adding, removing, and re-ordering pages in PDF files. Instead of either of those options, I often turn to Smile’s PDFpen ($75) or PDFpen Pro ($125). Both apps offer rich management of PDFs, including page management (moving, deleting, export, appending, and so on), optical character recognition, and direct manipulation. (The Pro version adds Microsoft Office compatible exports, form creation, website-to-PDF creation, and a few other features.) I find Smile’s software much more intuitive to use, much more richly featured for the precise kinds of changes and actions I want to take, and more full-powered than Preview. Between free, modest but strong, and expensive but super-powered, you should find an option that works. 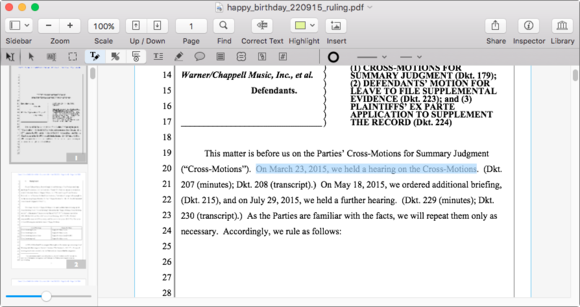 I used PDFpen Pro to open a scan of a court document in the “Happy Birthday” song lawsuit and run OCR against it to make it searchable.